Add to the festive atmosphere of birthdays, dinner parties, and holiday gatherings with this easy-to-use chocolate fondue fountain. Holding up to 2-1/2 quarts of chocolate, the auger-style fountain features a two-tier tower with a heated stainless-steel base. Just pour melted chocolate into the base and switch on the motor; the chocolate travels up the tower before gently cascading over each tier. Guests will enjoy dipping strawberries, cherries, marshmallows, pretzels, and more into dark semi-sweet, milk, or white chocolate. It can also be used with cheese, butterscotch, and other free-flowing sauces. The countertop appliance provides a temperature-control dial, a detachable stainless-steel upper section, nonslip feet, and an easy-to-disassemble design for quick clean-up. 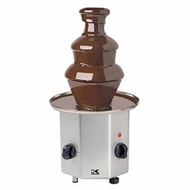 The stainless-steel chocolate fountain measures approximately 9 by 9 by 16 inches and carries a one-year limited warranty.